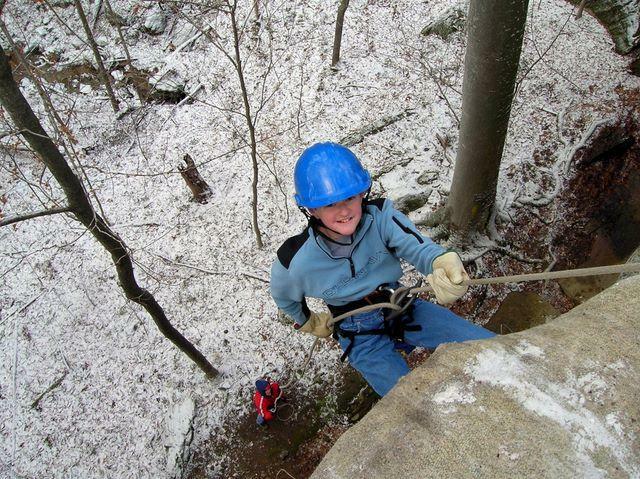 Carter Caves State Resort Park will present a weekend of outdoor adventure with its sixth annual Winter Adventure Weekend, Jan. 23-25, 2015. Guests will be able to enjoy hiking, kayaking, recreational tree climbing, cave tours including wild cave trips, winter survival, rappelling, archeological field trips, rock climbing, a zip line and other adventures. Guests will be able to select from a list of trips they want to take – for beginners and advanced winter adventurers alike. All of the trips and events are led by guides. Each trip level is based on the difficulty and skills required. The higher the level, the more skills and special equipment are needed. Guests will be responsible for appropriate dress, water, snacks and other items. The list of the trips, along with registration information and other details for the 2015 event are available at www.winteradventureweekend.com. All participants must register online at this site. The site can be viewed now and registration starts Dec. 12. Some new trips have been added for this year's event, including photography workshops and a wild cave trip called the Bat Cave Backdoor. Other wild cave trips being offered include a Cascade Gone Wild Trip, a Lantern Trip into Sandy Cave, and a 5-hour trek into Tar Kiln Cave. Because of their popularity, nine wild cave trips have been added for 2015. The weekend will start with programs and workshops on Friday afternoon. Evening entertainment each night includes a campfire social along with local Bluegrass music with Beau Lambert and Fire in Line on Friday night. On Saturday night, there will be a silent and live auction by the Friends of Carter Caves and a squeezebox competition; Kentucky’s own Heath & Molly will perform. Participants will be able to submit photos in the Winter Photo Salon competition. Categories include winter adventure, caving and local nature-adventure photos. The images will be shown during the Saturday night program, and winners will be awarded ribbons. The park is off Interstate 64 at exit 161. Take U.S. 60 east. Go approximately two miles and turn left on KY 182 north. The park entrance is three miles from the left turn onto KY 182 north. The phone number for the park is 1-800-325-0059. Carter Caves State Resort Park in March will play host to the national championship of an emerging sport. It’s called “Orienteering” and Kentucky Parks Commissioner Elaine Walker says it’s a race that involves using navigational skills and a map to go from one place to another. The U.S. Individual Orienteering Championship is scheduled for March 27th through the 29th. The Kentucky Department of Fish and Wildlife Resources’ new Boat Sober mobile app for smart phones and tablets informs boaters about boating under the influence and overall boating safety. Boaters can download the app now.